It’s tomato time in my home and garden…. man I love this time of year. I brought home a bushel from my favorite farmers stand yesterday and I hope to do some canning in the evening this Labor Day Weekend. We’ve been blessed with amazing weather so it is super fun to play catch up out in the garden pulling out the dead plants and adding new mulch to spruce up the perennials. With all these fun chores in mind I was on the look out for a healthy delicious meal to put together when I happen to rub up against my basil plant out in the raised bed area. I couldn’t stop thinking about my trip to LA last year when I had REAL Caprese Salad at a cute Italian restaurant with my friend Mud. Today I’m sharing the recipe I put together for lunch and I’m wishing you all were here to try this! Basil from my home garden.... I'm gonna have to make up another batch. Heat the balsamic vinegar in a saucepan over low heat until it reaches a gentle boil. Continue cooking and stirring occasionally for about 15 minutes or until it reduces to a thick, pourable glaze consistency. Cool the glaze before using. Slice the tomatoes into thick slabs. Remove extra long stems on the basil. Alternate layers of tomato slices, mozzarella slices and basil leaves to cover your serving platter. 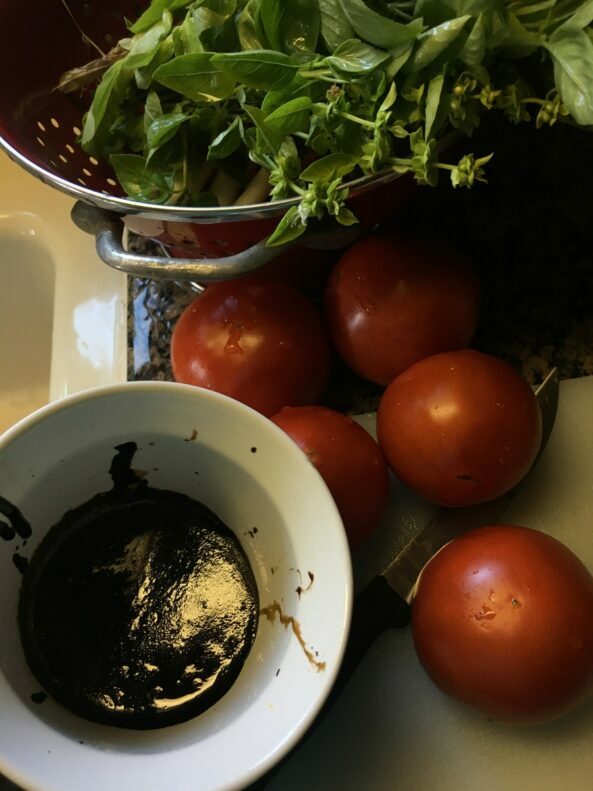 Drizzle the top of the tomatoes, mozzarella and basil with the balsamic glaze and extra-virgin olive oil. Season the entire dish with salt and pepper to taste. The cookware is Extrema – highly recommend it! 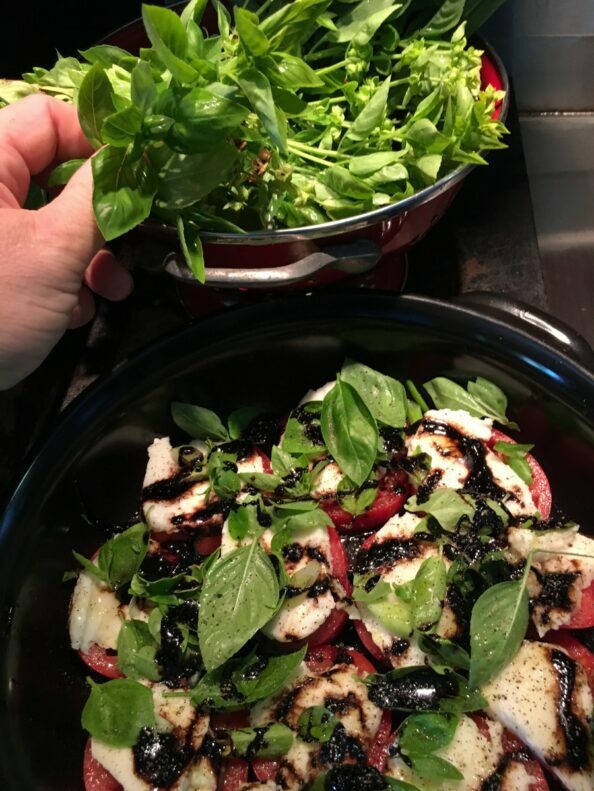 Basil from my home garden…. I’m gonna have to make up another batch. Make a glaze out of the balsmaic vinegar. Have you ever had a salad you could make anytime of the year? I’d love to hear from you so please comment below and share your thoughts. You are always welcome to send me a personal message on my contact page featured on this site.